1-3 Peridium longispinum Jörgensen; 1, right lateral view, VS-R-133b, 1-3cm, Y28/0, 300x; 2, dorsal view, VS-R-151b, 1-3cm, G39/3, 300x; 3, left lateral view, VS-R-133a, 1-3cm, L28/0, 300x. 4-5 Peridium sp. ; 4, right latero-ventral view, VS-R-60a, 3-5cm, J10/2, 300x; 5, right latero-dorsal view, VS-R-106b, 1-3cm, E49/3, 300x. 6-9 Lithomelissa hystrix Jörgensen; 6, left lateral view, VS-R-106b, 1-3cm, H42/3, 300x; 7, ventro-lateral view, VS-R-106b, 1-3cm, Y13/4, 300x; 8, right lateral view, VS-R-93b, 1-3cm, E21/1, 350x; 9, dorsal view showing large sagittal pores, external neck lattice not developed, VS-R-60b, 3-5cm, E39/1, 350x. 10-13 Lithomelissa thoracites Haeckel; 10, right lateral view, VS-R-60a, 3-5cm, Q36/0, 300x; 11, ventro-right lateral view, VS-R-92b, 1-3cm, D23/4, 350x; 12, dorsal view, VS-R-60b, 3-5cm, V48/2, 350x; 13, (? ), ventro-right lateral view, VS-R-60b, 3-5cm, U28/0, 350x. 14-15 Lithomelissa laticeps Jörgensen; 14, right lateral view, VS-R-93b, 1-3cm, Y46/2, 350x; 15, right lateral view, solid keel developed between apical and dorsal spines, VS-R-92b, 1-3cm, N48/3, 350x. 16-18 Lithomelissa cf. galeata (Ehrenberg) ? 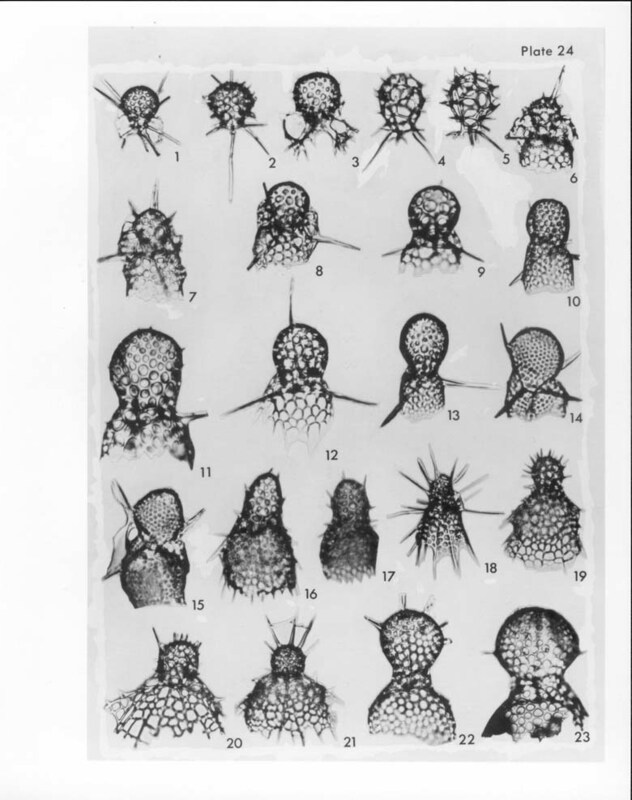 Popofeky; 16, right latero-ventral view, VS-R-60b, 3-5cm, K39/1, 350x; 17, right lateral view, VS-R-60b, 3-5cm, Y50/0, 300x; 18, ventral (?) view, VS-R-60b, 3-5cm, C40/0, 300x. 19 Acanthocorys variabilis Popofsky sens. emend. ; ventro-right lateral view, VS-R-60b, 3-5cm, O51/1, 300x. 20-21 Arachnocorys umbellifera Haeckel; 20, right lateral view, VS-R-106b, 1-3cm, C48/3, 300x; 21, ventral view, VS-R-64a, 1-3cm, X20/4, 300x. 22-23 Lophophaena cf. capito Ehrenberg; 22, dorsal view, VS-R-60a, 3-5cm, L6/0, 300x; 23, ventral view, VS-R-71a, 1-3cm, O21/0, 350x.